After "Las Vegas" visit in Dec 07, we got a chance to visit the Wisconsin state mainly due to the long weekend. We 4 office colleagues (Manish, Vishwanath, Siddhartha & myself) were eagerly waiting for such change due to regular workload which successfully landup into planning such scenic place called Devils Lake state park near Baraboo city of Wisconsin. Devil's Lake State Park’s bluffs are part of the Baraboo Range, which scientists believe were formed 1.6 billion years ago, making them one of the most ancient rock outcrops in North America. The Baraboo Range includes the North Range and South Range of hills, which surround a canoe-shaped depression called the Baraboo Valley. The city of Baraboo is near the center of the valley. The north and south ranges meet in the east (just west of Interstate Highway 90-94) and west (at Rock Springs, Wisconsin). 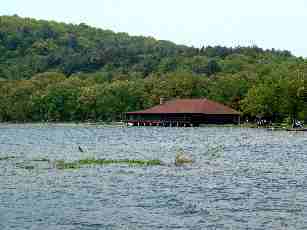 Devil's Lake is 3 miles south of Baraboo in the South Range. These ancient hills are formed of quartzite rock, which consists of grains of sand tightly cemented together. Prehistoric Indians once inhabited the park and constructed a number of effigy mounds in the shape of birds and animals. In more recent times, Ho-Chunk (Winnebago) Indians had a summer fishing village along the north shore of Devil's Lake and a winter camp on the southeast shore. We started from Chicago downtown in the morning around 7:30am and reach the Lake area around 12 noon with 2 resting breaks on the way. We gathered all required information from the Information Center which was not that actively informative as compare with our other experiences of the information centers. The place has been already set by this time with the picnickers/hikers. Children's were enjoying the shore water while younger children's checking the depth of the water by throwing the small rocks inside the water. We decided to take the East bluff Trail (1.1 mil). Our small trail started from the north end of the lake. 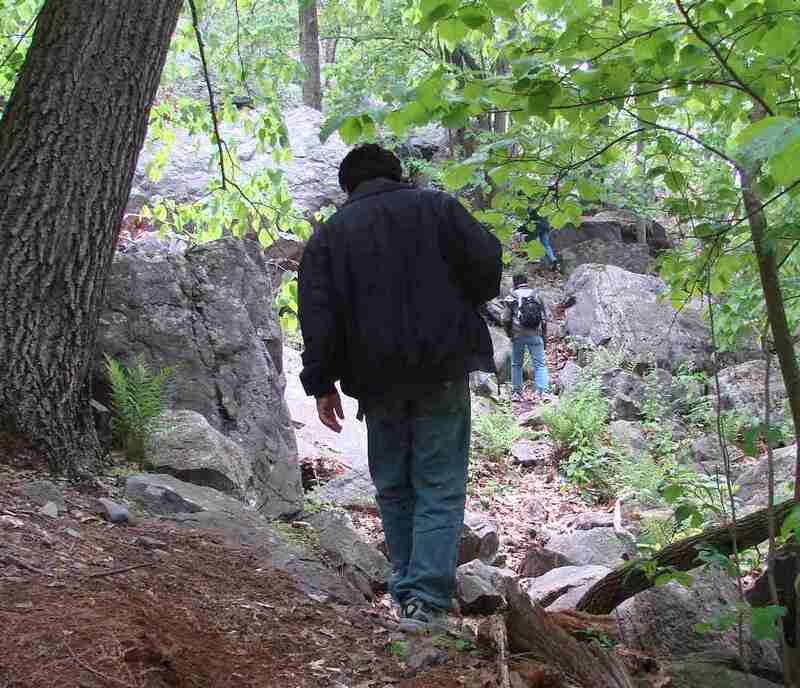 Twice we went inside the rocky area and join back to the actual trail near the rail track. Many climbers were attempting some of the climbing routes nearby. For me it was quit familiar activity, so on the way; we had brief conversation of how people climb and use the gear. We reached the south end, both SLR camera's tried their luck to see the entire view and I wasn't any exception to join the league of the amature photographers. Unfortunately the Canoe wasn't available due to number of tourist in queue. So we decided to return back to the North end of the trail from where we started. We saw many people enjoying the row boating , canoeing, wind surfing, fishing, biking & few of them were enjoying the scuba diving too. Nice to see so many adventure activity at a time. It was great experience since had some sweating though the weather was pleasant and somewhat foggy. We all thanks Manish for the nice drive and keeping all of us awake while he was driving his vehicle. All together it was nice experience and on top of that had buffet, in one of the Indian Restaurant while returning to regain our energy level. I will suggest this to anyone who are adventure lover's and being in the nearby city/state.